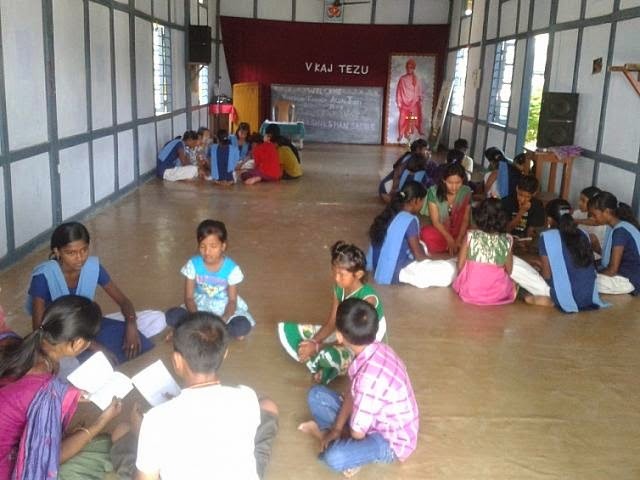 The inaugural function of the medical van donated by IDRF (India Development and Relief Fund, USA) to Vivekananda Kendra,Arun Jyoti was organized at Rangfraa Mandir, New Chingsa, Kharsang, Arunachal Pradesh on 16th July 2014. A meeting was organized at the Mandir premises. Sri Nampong Ngemu, Vibhag Pramukh of Vivekananda Kendra, Arunachal Pradesh formally dedicated the service of the vehicle for the poor and needy patients of Arunachal Pradesh. Speaking on this occasion the Doctor of Vivekananda Kendra highlighted the health activities of Vivekananda Kendra in Arunachal Pradesh. The priest sprinkled holy water over the vehicle with traditional chanting and blessed the medical team. Prasad was distributed among the villagers after the meeting. After the meeting on the same venue one medical camp was organized and 51 patients were examined and treated. Next day i.e. on 17th July one more medical camp was organized at New Khimiyong village of Miao circle, where 107 patients were treated and medicines were distributed. 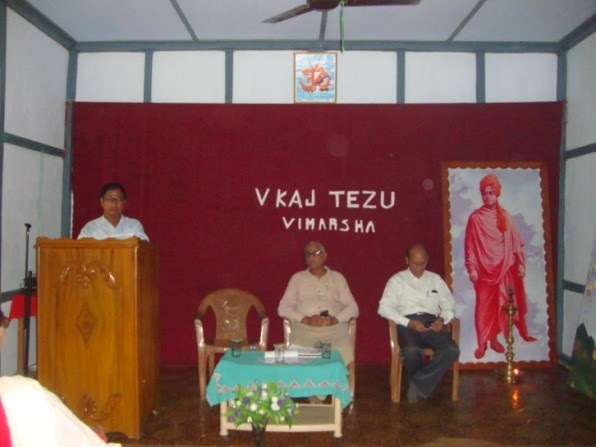 Vivekananda Kendra, Branch-Tezu celebrated Guru Purnima on 29 July 2014 at VKV Tezu. The programme started with Mangalacharan by VKV Student Tezu. 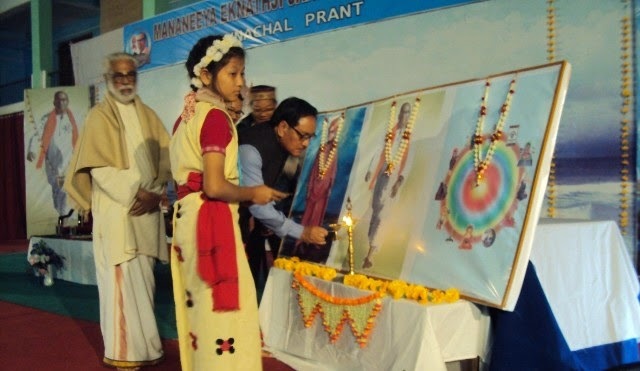 The occasion was conducted in the presence of Shri Pandeji, Senior Karyakarta Of Kendra and other Krayakarta and devotees of the mishim Society in the Tezu. followed by Guru Bhajan by VKV Student. Shri Ashok Atale, Nagara Sangthak of Vivekananda Kendra, Tezu gave a brief introduction about Vivekananda Kendra and it’s various service activities in Arunachal Pradesh. 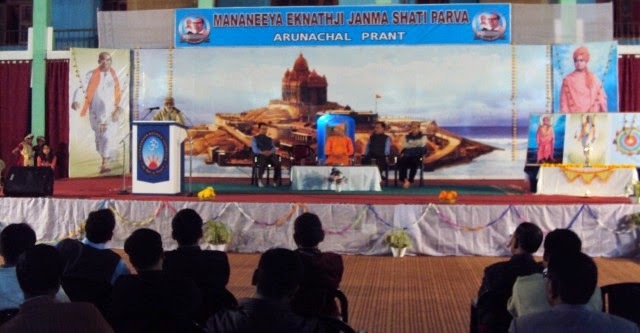 In his introduction, he talked about the seed of Swami Vivekananda being sowed in Arunachal Pradesh through Vivekananda Kendra Vidyalayas and various other formal and informal education centres . He also emphasized on the various vocational centres carried out by the Kendra in order to empower the women both socially and economically. 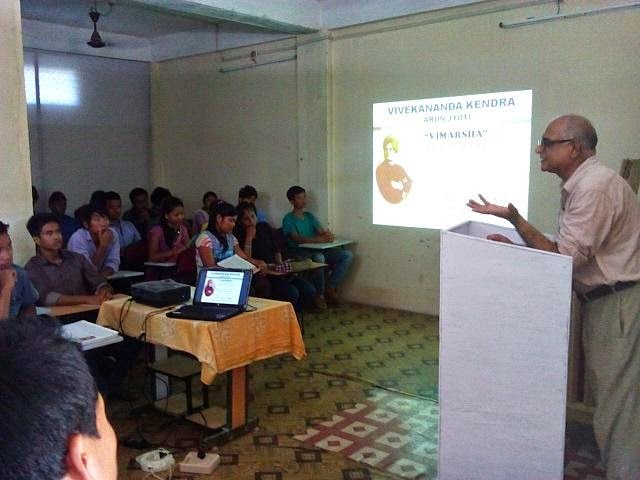 Further he cited about the ‘ MAN- MAKING AND NATION BUILDING ‘ the motto of Vivekananda Kendra. Principal of VKV Sailu Didi, Delivered the speech on Important of the day she explained regarding Guru Purnima. She inspired gathering to take Sanklapa on this suspicious day of our society to strengthen the Guru Shishya Parampara. Shri Amoso Khamblai, Founder Secy. Mishmi Faith Promotion Society felicitated Beloved Shri Anduho Talio of Loiliamg Village, Lohit. 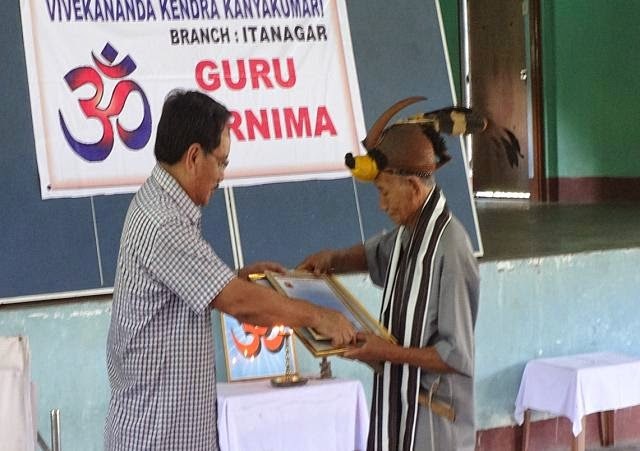 Senior Priest of Mishmi Community with a citation and a memento for his sincere and dedicated effort to revive and restore the age old indigenous heritage of the Mishmi community and to the Arunachali society as a whole. Shri. 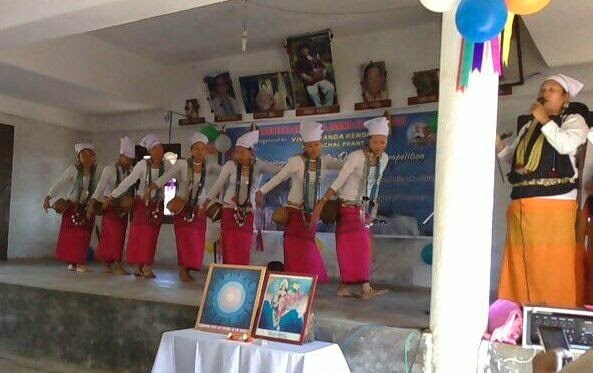 Amoso Khamblai Expressed he important role of Guru in mishim Society he told that in mishmi society guru takes the major decision also guided the participants of the programme and thanked Vivekananda Kendra for taking such a moral initiative to felicitate the priest. Sri Kruleso Ngadong, Nagar Pramukh of Vivekananda Kendra, Tezu Gave the vote of thanks. Programme way successful due to participation on society members it was concluded with shanti mantra. Every year Vivekananda Kendra organizes such felicitation programs in order to recognize the yeoman services being rendered by various elders and priests of the society to promote their indigenous faith.